Oh the joy it brings! So much came out, but we were very careful of what we put back in. A glimpse of the new light fixture, made out of an Easter basket with the handle removed and a hole drilled into the bottom! We wanted a wire basket but didn't have one that was just right...this turned out pretty darn cute anyway! I made some curtains out of some remnant fabric. I love the pattern with the little tiny bit of teal and the pale yellow ribbons. So simple and easy to make. I cut and hemmed the fabric about an inch wider than the window. Then I stapled the fabric to a trim board that was just slightly narrower than the fabric and I pneumatically nailed the trim board to the wall above the window. This window covering is just for appearances, it doesn't need to be closed. We built a "counter top" over the washer and dryer. Scott planed some old fence boards so it would be smooth and I rubbed it with some fairly dark stain. We can't have everything in here white. We just love our old wood. My little ceramic fish is just perfect for holding my bleach pen. Some dryer sheets and the teal globe that Scott just wouldn't let me get rid of. It looks perfect right here! The lower shelving is a free cabinet that came from Craigslist. I tell you, my hubby is OBSESSED with free things! Scott removed the doors and the horrid laminate that was on it and then primed and painted. I added a silver curtain rod and made some curtain panels to hide our cleaners and other miscellaneous stuff. I think this fabric is kind of beachy, don't you? Then came the upper wall shelves for some extra storage and display. These were old cabinet doors that Scott cut down to size and I put up with the wooden brackets that used to be in our son's room. The perfect spot for my .59 cent baskets found at a discount retailer. The clerk was certain it was a pricing mistake but finally gave in and let me take them home with me. I'm pretty convinced she wanted them for herself. Bummer. And now for the accessories!!! I put some of the leftover fabric from the curtain onto this cork board and framed it in with some turquoise ribbon. Some "artwork" created from printouts that I put into frames...I love these. 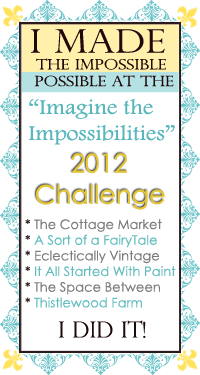 Another inspiring free printable...you can find this one HERE at http://houseandhone.blogspot.com/2012/01/this-year-i-will-printable.html. There were other color options too. Check out all the other fun stuff Miss Emily Hone has to offer while you're there! This one is also in a thrift store frame. The top shelf holds some of my favorite white ceramics. All of the ceramic fish dishes are thrift store finds from over the years. I finally found a place to display them!!! It's hard to get a photo of everything in this little room ~ this is as close as I came. We love our NEW AND IMPROVED LAUNDRY! We don't have to talk about the garage now, do we??? Thanks for stopping by! We hope you enjoyed your visit! We would really LOVE IT if you wanted to follow along with us. Follow by clicking Google Friend Connect on the sidebar or typing in your email address. You can even friend Pondered Primed Perfected on Facebook and Pinterest. We love making new friends!!! How awesome, and cheery! you must smile from ear to ear now doing laundry! I will be working on mine soon too. I can see why you love your new look. The before and after is amazing. Great job...I know it was a whole lot of work but so worth it! I love it! It's beautiful:) You did a lot of work and it definitely paid off! I would love doing laundry in the room like that. happy, bright and beautiful in a laundry room is just not expected... but it's gorgeous! i'm sure this will inspire many to start a redo! CUTE! CUTE!! I love the transformation. What a fun idea for a lamp shade to use a basket. This is stunning! Thanks for linking up to t2t Tuesday at Sassy Sites! I'm loving this laundry room! I just popped over from the A to Z link party and I'm so happy I did. I don't know what it is about laundry rooms, but I just think that they are so much better when they're pretty!! Mission accomplished, Sherry!! Your laundry room looks amazing, and so pretty. I love the open shelving and the little pops of colour ! how wonderful! Love it all. And what an appropriate scripture for a laundry room! :) Talk about a dramatic before and after!! Great job--so many nice touches! Can I come to your house to do my laundry?!? Thanks so much for sharing at the Tuesday To Do Party! Sherry.....very very nice! I love how bright it is and how you have decorated it. You won't be needing that "Laundry today...naked tomorrow" sign as I can see you will be up to snuff on the laundry. Who wouldn't be in that gorgeous laundry room! And I love your breakdown of costs as it clearly shows it is possible! I too love that little teal globe and that salad server is gorgeous and you're right...it needs it's own special spot to be shown off. It looks great there along with the lemons. I could go on and on but I need to go work on my projects now as you've made me feel like a slug with all you've accomplished! Amazing work you two! Great job!!!!! Gorgeous!!! You guys did an awesome job. Wow big difference! This is giving me inspiration for me to do something to my laundry room. I LOVE your Create in me print. I'm going to have to make one of those too! What a transformation! Certainly would inspire me to want to do laundry! Great job. Your laundry room looks so bright, clean, and cheery! Great job. You know you are a rockstar, right? But that basket lamp is PERFECTION! Congratulations! You conquered your "impossible!" Thanks for linking up at the party! Wow, I can't believe the transformation! It looks so great now! Wow this looks amazing! We're going to be doing our laundry room soon so thank you for the inspiration! I love the white shelves, so beautifully done! The transformation is amazing! Great Job. Amazing redo. Love the imagination for wasteless decorating. Now your laundry can just about lose the title of chore and be a pleasure just relaxing as you do your laundry. I think you accomplished all your goals - it looks terrific. I love the counter! I can only imagine how delightful it must be to do the laundry (smile). I'm now a new follower, please drop for a visit when you can. ahhhh super duper cute - GREAT transformation. i love the colors in there! so cute! I'm coming over to do my laundry! Love that basket turned light - fantastic idea! The wooden countertop is beautiful! Thanks so much for linking up to the Challenge. So many nice touches for a laundry room--I think doing laundry could be fun in this room! Thanks for linking up to Share the Love Wednesday! Great work on the laundry room. Love the bushel basket used as a light fixture! SO nice! Makes me anxious to start on our laundry room. Not only organized, but it is pretty and decorated, too! Great job - quite a transformation. It looks really pulled together now - well done. Wow, you have totally inspired me. You did an incredible job. I love how sunny it is. This would make me want to do laundry more often...seriously. You totally outdid your self. I would love it if you would share this at our linky party. Hope you can join us. Mission Possible! What a lovely laundry room you have created! You are wrong ... it is magazine worthy! What a beautiful transformation! Wow! Your DIY details add so much charm - it's one of the sweetest laundry rooms ever! Love it! Great makeover. What a difference from dark to light and bright. Love the added pops of color and that light is great. WOW!!! I am loving this makeover. I'm such a fan of bright whites with some natural wood and a few bright pieces here and there. And I LOVE that scripture for a laundry room!!! Totally need to use that one :) Thanks for inspiring... pinned it! Very pretty! You hard work paid off! Thank you for sharing your lovely post at Potpourri Friday! What a wonderful transformation! I bet it makes laundry so much more fun! You've done a lovely job and should be proud of yourself - it's beautiful! That laundry basket light is over-the-top GREAT! The whole room is great! Another highly successful project. Thanks for sharing at the Kiss & Tell party over at I Gotta Create! Love it! Very bright and cheerful. Almost makes you Want to do laundry. ALMOST. I thought I could hear angels singing when I compared the new to the old! Lovely! Wow, what a transformation! It looks so good. I love the color combo. Love it! If you have a laundry-room-warming party, can I come? Our LR is really tiny.. it shares the space with our furnace & hot water heater. But I am still in the planning stages (in my head) of what I am going to come up with. Your Laundry Room looks great!!! I think we have the same Washer and Dryer (GE) , and I have a question for you. I see that you (or your husband) put a wooden counter over the washer and dryer. Love that idea!! My question is, does your washer ever move around and bump the sides?? I would love to have a wooden counter like yours but I am concerned that my washer won't stay in place. Have you had any problems?? Thanks for your time!! Hi Vickie! Thanks for stopping at our blog! I love that washer and dryer. Occasionally it gets a load unbalanced and does a little bit of banging. Generally it stays in it's place though. Scott says it should have a half inch of "movement" in it...but beyond that and it's probably off balance. Maybe the feet need to be adjusted or something? The "counter" we built over it was actually built with a bit of a clearance. It's supported with brackets attached to the wall. I made sure Scott knew that if there was any kind of issue or problem with the machines or the plumbing we would need to be able to move them out quickly with little trouble. He was very good about making that part of the plan. I have a post that shows the structure of the "counter" being built. Scott did this base structure and I added the smoothed fence boards on with a nail gun. If you haven't seen that earlier post it is here: http://ponderedprimedperfected.blogspot.com/2012/01/gray-cloudy-and-wet-thats-forecast-in.html I think the picture in this post shows that there are several inches of clearance above the washer and dryer. I've just put a board on the front to disguise this. I hope this helps! I absolutely love having the counter. We thought we would like them stacked but it was a disaster...they blocked all the light both from the window and the light fixture. And there wasn't any surface to set anything or fold. This is sooooo much better. Great job on your laundry room makeover!